Clarified Butter (Ghee) Why Not? This article may put a smile on some faces that have been denied clarified butter (ghee), while it won't fail to surprise some as well. Some rice and dal minus the clarified butter (ghee), is supposed to be a healthy meal! You have eaten ghee all your life, and now suddenly, your lipid levels have gone up and the doctor has asked you to cut on your intake of ghee. This ingredient has been banned in all your meals, and you feel like you crave for it even more now! 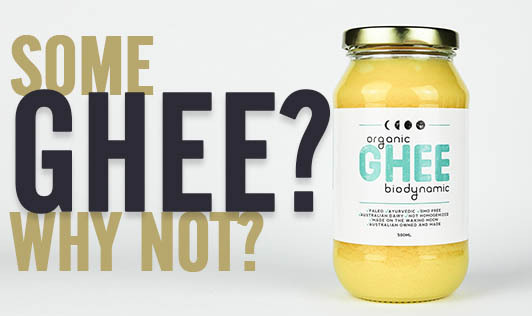 What is ghee? It is called clarified butter and is produced when butter is heated until all the water evaporates and the milk solids are left behind. This clear liquid that remains is ghee. In Ayurveda, ghee is used as a medicine to treat pain, joint problems and promote longevity. It is known to improve memory, strengthen the nervous system and lubricate your connective tissue making you flexible. It is also known to improve digestion, assimilation, and absorption of nutrients in the body. A study published in the Journal of the Indian Medical Association showed that consumption of small amounts of ghee did not harm them. It, in fact, reduced their risk to develop cardiovascular diseases by decreasing their total cholesterol levels. A herbal preparation of clarified butter (ghee) was found to reduce symptoms related to psoriasis as well. With all these health benefits of ghee, why are we blaming it for the rise in heart problems? For ages, people in India have been using ghee and have not complained of heart problems. But today, an overall unhealthy lifestyle and decrease in the quality of ghee have led to this claim. Pure, unadulterated clarified butter (ghee) has low amounts of polyunsaturated fats (PUFA). Fats with a high proportion of PUFA is known to cause heart problems. But today, ghee is adulterated with vanaspathi, a form of trans fat, and the chemical composition of it has changed to the extent that it has become hazardous to health. Apart from these, factors like stress and unhealthy eating habits have further increased the risk to develop these diseases. So, in the light of science and research, clarified butter (ghee) is beneficial to health when taken in the right amounts. If you do have access to some pure ghee, and do not have other health issues, there is no harm in having about a teaspoon a day! Now, didn't that excite your taste buds?? ?